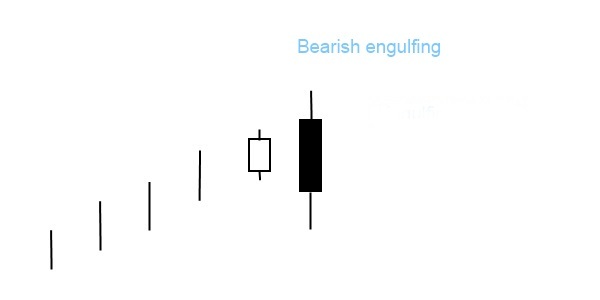 The bearish engulfing candlestick pattern is considered to be a bearish reversal pattern. It forms usually at the top of an uptrend. It consists of two candlesticks: the first is white and the second black. The size of the white one is not that important, but should not be a doji, which would be relatively easy to engulf. The second candle in the pattern is the reversal signal. This candle comprises a long black candle. Ideally the high of this candle should exceed the high of the previous candle followed by the formation of a new low. The bigger it is, the more bearish the reversal. The black body must totally engulf the body of the first white candlestick. Ideally, the black body should engulf the shadows as well, but this is not a requirement. It is a more powerful signal than the dark cloud cover pattern because the activity of bears is more tangible in the bearish engulfing pattern than in the latter. Counter part of this pattern is the bullish engulfing candlestick pattern.